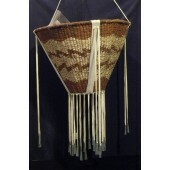 White Mountain Apache Burden Baskets are made from available materials such as willow or yucca root. The stems are soaked in water and then split, with the inner part being used for the lighter colors and the outer bark for designs in reds, brown, and greens. Since the Apaches were once nomadic hunters and food gatherers, the women wove these baskets to carry firewood, roots or berries. The tassels, made from deer or cow skin, were mainly for ceremonial or decorative uses. Tin was placed for ornamentation and to warn off snakes while gathering. Another interpretation is that it was an Apache custom that a son-in-law should never be in his mother-in-law’s presence. When he heard the sound of the tin, he would get out of the way to show his respect.